Acquired directly from the artist by the grandfather of the present owner and thence by descent to the present owner. Mr Samy Kinge has kindly confirmed the authenticity of this work. Fleeing Romania, where he was born in 1903, Victor Brauner sought refuge in France in 1938, where he would spend the war years hiding in a mountain village. In 1948, four years after the war ended, alarmed by the wave of expulsions that was affecting Romanian immigrants, he left for Switzerland, where his friends Sylvie and Hans-Rudi Stauffacher gave him shelter. His health benefited from this move as he was better able to receive the care he needed there. Paradoxically, as an exile in self-imposed exile, Brauner enjoyed an extremely fruitful period. Introduced to the work of the psychoanalyst Maguerite Sechehaye, by his hosts, Brauner translated into painting the therapeutic method she advocated, the so called "realisation symbolique" (a method of resolving conflicts and psychological tensions by reproducing them in a small-scale personal theatre). Most of the works from 1948 therefore "stage set" autobiographical episodes which are amplified or magnified by the imagination and the memory of the artist, in a simple, precise manner, evoking folk art, as well as the so called primitive art Victor Brauner was starting to discover and of which he later, became a passionate collector. These paintings often deal with Oedipal themes, a sort of sentimental, burlesque science that the artist dubbed "Mamalogie". Le Grand Voyage is characteristic of this period. 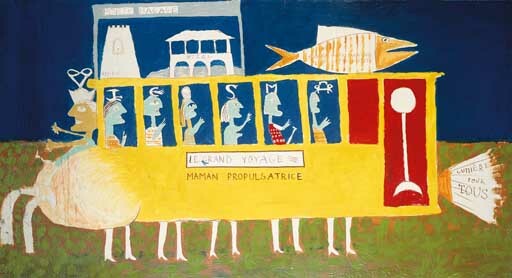 The passengers in this improbable, nourishing coach endowed with feet and breasts in the centre of the composition, are designated by initials which correspond to those of the group of friends who occasionally gathered together in Switzerland in 1948: J for Jacqueling, Victor Brauner's wife, C for Claude Tarnaud, O for Audine his partner (Victor Brauner is not hampered by spelling conventions), S for Sylvie Stauffacher, M for Michel Herz, HR for Hans-Rudi Stauffacher. In the luggage-hold on the roof are depicted souvenirs from trips to the surrounding area of Zurich, and Regensberg (notably the Regensberg dungeon, the pride of the locality), and Mount Etzel. But, in the Braunerian world, it did not take long before these simple excursions became more extravagant dreams of travel. A coach could thus easily transform itself into a "propelling mother figure" dispensing milk, light and human kindness in abundance (these exact same types of maternal vehicles recur in the very last series of works exhibited by the artist at Alexandre Iolas Mythologies et fêtes des mères). A mid-day snack is transformed into a jovial, emblematic fish and a merry crew is placed under the captaincy of a little, beaming, Victor Brauner, wearing a tiara, which is actually his signature or rather monogram: Victor (several years prior, he had begun to follow the signing of his first name with this mathematical symbol of infinity). Nothing is ever anodyne with Brauner, who has experienced the most intense of violent dramas as well as the simplest joys, which we often deem mundane: Le Grand Voyage, which even in its composition resembles an ex-voto (a big ex-voto to friendship) bears witness to this.